A blog can be many things: a writing laboratory, a chance to cover the news your way, an online lab notebook, a personal diary of your life in science. Whatever approach you take to your blog, one challenge is figuring out how to do it in your own voice. How will you tell your own scientific story? Let’s face it: There are lots of blogs already out there. Your challenge is to figure out how to carve your own niche in the online science blogging ecosystem. Below, we have included brief summaries of each chapter that deals with the unique challenges of finding your own voice for a wide array of different career paths, life experiences, and blogging styles, plus a list of online resources to expand on some of the points raised in each chapter. Your approach to science blogging might be influenced by your own life experiences. Indeed, some of the best scientific stories are also personal ones. These are tales in which the blogger’s own experiences can provide valuable context for the scientific content and can create a relationship with the reader. Read this chapter to learn from Ben Lillie, co-founder of The Story Collider, who explains how putting more of yourself into your writing can bring out the best in both the story and the science. Straight “explainers” can be great, and are often the best choice for getting a point across, but I do think narratives and personal experience are vastly underused. That’s understandable. Particularly if you’re a scientist who blogs, it’s easiest to default to a writing style you know, and science papers are (for very good reasons) written in the third person, without a heroic narrative arc. But stories can engage, they can pull people into a subject, they can be the thread that keeps them reading through the whole piece. The strongest stories can forge an emotional bond that helps people connect to information—and each other—in ways that straight facts usually don’t. Many bloggers are also heavily influenced by their identity. While social media can be an excellent resource and toolbox for minorities in science and science communication, the discrimination found in the workplace can be just as prevalent online. Alberto Roca, executive director of the non-profit Diverse Scholar and co-founder of the National Postdoctoral Association’s diversity committee, explains how online tools can give a boost to voices that need to be heard and can increase access to a variety of mentors and role models. Fifty years after the Civil Rights Act was signed in the United States, the nation is still grappling with structural inequities suffered by ethnic minorities. With respect to STEM workforce demographics, the representation of African Americans, Hispanics, and Native Americans has not reached the general U.S. population levels of 13 percent, 17 percent, and 1.4 percent, respectively. Notably, by 2050 the United States will be a majority minority nation, with the Hispanic/Latino population alone reaching almost 30 percent. How do we encourage this growing minority population to be engaged in STEM discussions as informed citizens? One solution is for the nation to have more minority STEM role models. Social media can amplify the visibility and voice of such individuals. Where Are the Science and Race Blogs? Gender disparities can be found everywhere in the scientific world, and science blogging is no different. Kate Clancy, who blogs at Context and Variation and is assistant professor of anthropology at the University of Illinois, Urbana-Champaign, provides valuable suggestions for combating sexism while using blogs to advance your own scientific career. So what will happen to you if you openly identify as female on the Internet? Although some frustrating things may occur, here are just some of the positively awesome things I’m pretty confident will happen if you identify as female. You will very likely develop a posse. We women science bloggers stick together, so find us online. We will support you, and viciously attack your trolls, and empathize with your struggles, in our common desire to say delightful things about science. You will learn to express yourself about topics that you find interesting. You will hone your craft. You will try a few different things on your blog, and some will become regular features. You will win the admiration of others. Someone, probably several someones, will enjoy what you have written. Starting out as a journalist means building networks, developing a reputation, and gaining the trust of your readers. Once upon a time, journalists had to get access to precious column inches in newspapers or magazines, but now beginning journalists can use blogs to hone these journalistic skills and others. With examples from his own career trajectory, Colin Schultz, blog editor at Hakai Magazine, provides critical insight into how blogging can give a young journalist a head start. Journalism is one of those rare professions that one can break into without any formal training. There are a few well-worn paths to gaining experience and exposure, such as taking on an (often unpaid) internship or enrolling in a journalism program. [But] blogging has added a new way to develop and showcase your abilities. It’s a way to build a portfolio of work without having to wait for anyone to let you do it. As a blogger you may often write for free, but compared to paying for school or having to move to a big city for an internship, it’s a path worth considering. Science blogging takes on a whole new dimension when it’s done from within an institution. Public information officers (PIOs) are positioned to offer valuable perspective to the science blogosphere. In this chapter, Karl Bates, director of research information at Duke University, shows the reader how science blogging can be used to enhance the reputation of a university and its research activities. Blogging gives [PIOs] the remarkable new ability to speak directly to the public, rather than being stuck in the media relations rut. It’s a cheap and easy way to update campus news. It also gives the news office a chance to publish stories about personalities and the scientific process that would never make the cut with reporters but are precisely the kinds of science stories we really need to explain to the public what we do. What Is a Science PIO’s Job? Today’s students, whether fingerpainting in kindergarten or writing honors theses in college classrooms, are true digital natives. They enter their classrooms with a wealth of technological experience and knowledge, and with an unspoken understanding that their “real lives” and “digital lives” meld seamlessly together. How can educators leverage their knowledge and excitement about online tools in order to enhance their curricula and advance their teaching goals? In this chapter, blogger Marie Claire Shanahan, who is also a professor of science education at the University of Alberta, offers advice on how to use online tools to engage students in their own education. Students are attracted not just to the excitement of current science news; the form matters as well. One research team asked high school students to explain what they look for when they choose to read an article about science. They said they were more interested in pieces that were creative—that used metaphor, analogy, and poetic language to help explain concepts—than in ones written in a more formal, traditional journalistic tone. This is an important observation for bloggers and other online writers. A blog can be a great a form of scientific outreach, and blogging while in graduate school can allow students to explore new aspects of their research, expose them to ideas outside of their narrow focus, and help them develop their writing and teaching skills. Still, some people think that blogs are a waste of time for early career scientists. Jason G. Goldman, who started his blog The Thoughtful Animal while in his third year of graduate school, explores the pros and cons of writing as a graduate student and suggests how you can leverage your blog to actually boost your nascent scientific career. Why would you want to even entertain the notion of doing more work right now? Why on earth would you start your own blog while in grad school? Indeed, graduate students in the STEM fields (and all scientists, more generally) overwhelmingly blame time constraints for their inability to devote themselves to science communication. The assumption is that spending the time doing outreach will interfere with the goal of learning how to conduct research. But that assumption, as you will see, is flawed. It turns out that if you plan your science communication efforts thoughtfully, then you can capitalize on them to build your own scientific skills and to advance your own scientific career. And that’s not to mention the benefit of contributing to scientific literacy more generally among your friends, family, and the general public. Science Communication in Grad School: Should You or Shouldn’t You? Faculty on the tenure track often experience the greatest pressures in their career: pressures to achieve in the laboratory and the classroom, as well as pressure to do outreach. How can writing your own science blog help you on the tenure track? Could it be the icing on the cake of your tenure package? The Greg Gbur, author of the blog Skulls in the Stars and tenured professor of physics and optical science at the University of North Carolina, Charlotte, explores the advantages and difficulties of blogging on the tenure track, and how even when you’re under the most pressure, a science blog may be a worthwhile investment. Suppose a new faculty member decides to write a blog, or has an already established blog before taking the new job, how should he or she make sure it is treated as a benefit and not a detriment to the university? This is not an unreasonable concern: though blogging and other social media activities have become much more accepted even in the last five years, a new professor still runs the risk of having it viewed as an activity that takes away from the already heavy load of important work that needs doing. One’s overall strategy should involve showing officials at all levels of the university that blogging adds to academic life, and doesn’t detract from it. Many fine blogs exist to explain concepts or cover new findings, but not all of them conform to that standard. You might want to use your blog to cover scientific conferences. Many of these conferences have become more open to sharing their results with science bloggers, taking advantage of the power of social media. How should you cover these conferences? How should you convey the findings? What are the dos and don’ts? Peter Janiszewski and Travis Saunders, co-founders of the health blog Obesity Panacea, lend their experience in blogging scientific conferences to advise newer bloggers on how to get started. One of the toughest things about writing a science blog is regularly coming up with timely content that has not already been discussed elsewhere. Conferences can serve up fresh and largely exclusive content for days on end. In addition, your blogging efforts can increase the exposure given to important research presented at the conference, or even the conference itself. This is a win-win-win for you, your colleagues, and the organization holding the conference. Go forth! Carve that niche with confidence and make a home for yourself in the online science blogging ecosystem. 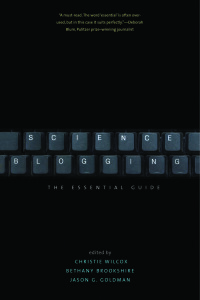 If you’re just starting out in blogging, make sure to check out the resources in Science Blogging 101. And once you’ve found your voice, we’ll help you take it to the next level.